I believe in health care that is based on a personal commitment to meet patient needs with compassion and care. 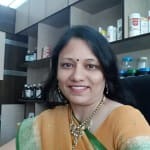 Dr. Madhuri Bhatt is a renowned Homeopath in Satellite, Ahmedabad. She has been a successful Homeopath for the last 14 years. She studied and completed MD - Homeopathy, BHMS . You can meet Dr. Madhuri Bhatt personally at Soham Homoeopathic Clinic in Satellite, Ahmedabad. You can book an instant appointment online with Dr. Madhuri Bhatt on Lybrate.com. Lybrate.com has a number of highly qualified Homeopaths in India. You will find Homeopaths with more than 34 years of experience on Lybrate.com. Find the best Homeopaths online in Ahmedabad. View the profile of medical specialists and their reviews from other patients to make an informed decision. Hello there ^^ I am a 17 year old girl and I have been experiencing intense hair fall. I noticed this quiet a few days ago but I ignored it since we have at least 100 of our hair falling everyday. My hair has become thinner than of what it was earlier. I tried some therapies at home by applying coconut oil and such. But it doesn't seem to work that well. I have curly hair. The thickness of my hair has decreased to half. I am really concerned about this matter. Can you please tell me some ways to treat my problem? I would really appreciate it, thank you! Hello. Hairfall is becoming a major issue nowadays. But it is multifactorial. Your life style, stress factor, diet, nourishment of hair, everything matters you hv to work on it. Increase your diet in protein apply nourishing oils. Keep hair clean. Prevent dandruff as it's the commonest cause for haitfall homoeopathic medicine has excellent results in it. For that I require to give details of the complaints. N you LL definitely benefited by it. I am having plantar fasciitis and calcaneal spur due to this having pain in heels. Please let me know medicine I am taking calc flour 6X but no relief. Hello, these r the specific remedies. But if your not benefited from it, your case has to b re evaluated. As there are many other remedies to treat the complaints so, your detailed case LL help to treat you effectively. Sinus - How Effective Is Homeopathy In Treating It? Awakening with a headache and on top of it a blocked nose is an unpleasant begins to the day. In the event that this turns into a standard event and even the face harms with general largeness in the head, it's a restorative condition called Sinusitis. Sinuses are air-filled depressions inside the skull bone. These empty spaces in the skull are arranged in cheek bones, brow, behind the scaffold of the nose and between the eyes. Another set is arranged in the upper area of the nose and behind the eyes. All the sinuses have the same coating that is available in the nose. This covering produces bodily fluid, which is depleted out of the sinuses through an opening in the nose. Homeopathy treatment can be a decent cure for Sinus of various sorts. 1. Silicea: One of the Best Homeopathic remedies for Sinus Infections with headache. Silicea happens to be one of the finest remedies in homeopathic for sinus disease. The headache caused by sinus fundamentally on right side happens to be treated best with Silicea. The patient requiring Silicea feels crisp and is extremely touchy to frosty air. Concealing warmly gives alleviation. One conspicuous sign for utilizing Homeopathic pharmaceutical Silicea as a part of cases of sinus happens to be stuffiness in the nasal parts. The discharges in the nasal areas get stopped up in hard coverings. On endeavoring to extricate these hulls, there is dying. 2. Belladonna: Top Homeopathic solution for sinus headache with smothered discharge: Normal Homeopathic prescription Belladona is one of the perfect homeopathic remedies for sinus diseases when sinus headache is because of smothered discharge. Belladonna is exceptionally useful when a Sinusitis patient grumbles of a brutal headache. The patient may get alleviation from the headache by restricting the head firmly or applying weight. Kali Bichrome is the top regular Homeopathic medication for Sinusitis where the discharge drops over into the throat regardless of leaving the nose. The discharge is thick and for the most part yellow. I am using homeopathy medicine for vertigo since 2 days. I have started allopathy for vertigo since 10 days. Is it safe to use both medicines for one symptom? Please help me. Hello. It's always better to follow one system at a time. As you can identify which Medicine actually helped you out. If you didn't find it beneficial than start the other one. I'm unable to treat my dandruff problem. I even visited dermatologist and used shampoos and tablets but still no change. My hair are becoming oily day by day. Please suggest some tips to wipe out dandruff. Hello. Dandruff is becoming a major issue. Using strong chemical shampoo leads to more damaging of the scalp. You should use mild shampoo. Wash the hair with prior proper oiling. Try to avoid spicy food in diet. Eat more protein rich food. Maintain hygiene by washing hair twice week. Do not use anyone comb. Drink plenty of water. Homoeopathic medicine always helps in dandruff n hair fall. It required your detailed case. But it will definitely help. Can Homeopathy Treat All Types Of Insomnia? Insomnia is a mental condition, which is characterized by a difficulty in falling asleep, even when you have the chance to do so. The causes of insomnia include stress, emotional or physical discomfort; environmental factors like noise, light or extreme temperature that interferes with sleep; and depression or anxiety. The visible symptoms of insomnia are inability to fall asleep no matter what, irritability, depression, lack of concentration and enthusiasm, and distressed stomach and intestine. Complications associated with insomnia can cause psychiatric problems, obesity, increased risk of long-term diseases or conditions like high blood pressure, heart disease and diabetes. Secondary insomnia: it stands for sleep problems that may be caused by health conditions, medications, pain or any other causes. Acute insomnia: it is also known as short-term insomnia and usually lasts for a night or a few weeks. Primary insomnia: it refers to sleep problems which aren't directly related with any health condition. Chronic insomnia: insomnia is described as long-term or chronic if you suffer from it for about 3 nights a week for 1 month or longer. Homeopathy is a boon towards treating insomnia. Efficiency - The efficiency of homeopathic medicines in curing the several problems associated with insomnia is unquestionable. Plus, targets at providing long-term cure for insomnia instead of just temporary relief. The approach that homeopathy adopts includes getting at the root cause of the problem, and weeding it out so that there's never a relapse of your condition. Safety - Homeopathic medication are far safer therefore, it is preferable and highly recommended. It serves invaluably during insomnia and does not involve any side effects. Hello Sir My 18 year son was detected for 10 mm gallbladder stone on 17 May 18 when USG done for upper abdominal pain. The medical specialist advised to take UDCA 300 mg for 30 days to break and removal of stone in natural ways and need to reviewed by surgical specialist. However he had continuous pain in the upper abdominal area with mild fever and heavy head on 27 May 18 and shown to the surgical specialist. The following medicines have been prescribed by him with advice to prepare my son for surgically removal of gallbladder. The medicines are Ofloxacin 400 mg BD, tinidazole 500 mg BD, combiflam TDS and Pantop 40 mg BD for -5 days. He taking these medicines for last two days. Now he feels better with no pain. I want to know that is it necessary to remove the gall bladder at this tender age? What would be the after effect of removal of gall bladder in long run? I came to know that there is homeo medicine called Berberis vulgaris mother tincture which can be taken three times daily of 1drops for naturally removal of this stone. What is the success rate of this medicine? Now my question is whether to administer homeo medicine first and wait for some time to see the result before surgically removal of gallbladder or should I go for removal of gall bladder. Hello. Gall stones can be treated successfully with the use of homoeopathic remedies. the drug which u mentioned is one of them.but it's not the only one.there r many other which ll definitely work on gall stone. removal of gall bladder can n b thought if persistent fever, nausea, vomiting, abdominal pain is there. otherwise homoeopathic remedies have good scope in it. I am Addy 32 years old n I am having ASTHMA & ALLERGY wen I get cool. I can go out wen raining. Some tyms it's really very hard to breath at mid nite. Can I get cure please tell me. Hello. Being an ashthmatic you should avoid humidity as well as getting wet. You can take nat sulph 6x twice a day for temporary relief. But for complete cure your complete case taking is required. And homoeopathic remedies have wide role in curing it. Throat Infection - Common Homeopathic Remedies That Can Help! Throat infections can affect anyone. Your throat will feel swollen and sore and swallowing may become difficult. The flu and common cold flu virus can cause infections along with allergies, bacterial infections, breathing polluted air or smoking. Conventional treatment only suppresses the symptoms; it also has side effects. Homeopathy focuses on rooting out the disease from within, instead of just concentrating on suppressing on the symptoms. All the homeopathic remedies gradually treat and cure your disease and have no side effects whatsoever. Belladonna: Belladonna is the best homeopathic remedy for throat infections. Belladonna is also good for Tonsillitis (swollen and red tonsils with white patches inside your throat) and difficulties in swallowing. Hepar Sulph: If you have a splinter-like sensation in your throat along with soreness, Hepar Sulph can be very beneficial in treating the symptoms. Phosphorus: Phosphorus is the best medicine for "clergyman's throat" (agitated tickling in your larynx when you speak). Lachesis: Difficulty in swallowing fluids when you have a sore throat is best treated with Lachesis. Chronic tonsillitis is also treated with Lachesis. Ignatia: If you feel like you have a lump in your throat and you cannot gulp food easily, Ignatia can work well. Bryonia: Bryonia is used to treat dry cough along with a sore throat. Drosera: Spasmodic, dry coughs with a sore throat are best treated with Drosera. Merc Sol: Red, swollen and sore throats are treated with Merc Sol. Throat problems that worsen with weather changes can be taken care of with this medicine. Arsenicum Album: If your common cold also gives you a sore throat, then you can opt for Arsenicum Album. This medicine is also useful if you have watery and thin nasal discharge. Aconite: Burning and a painful sore throat induced by common cold and sneezing are treated well with Aconite. Causticum: Sometimes your throat can get sore from shouting or if you talk loudly at a stretch. In such a situation, Causticum can prove to be beneficial. Argentum Metallicum: If your throat is sore and feels raw and worse after straining your voice, then Argentum Metallicum is helpful. Chamomilla: Chamomilla is mostly prescribed to children with sore throats and mucus formations in their chests. Baryta Carbonica: Enlarged tonsils, painful and sore throats in children are best treated with Baryta Carbonica. Could you please advise the loose motion medicine for 5 year old kid. And she is also having stomach ach as well. Hello, she must have suffered from gastroenteritis. As per your details. Kindly avoid roti, fats, like ghee, butter. Give rice, curd. Light food. N plenty of liquid. No cold food. All freshly made food. Watch for dehydration. N you can give homoeopathic medication Ars. Alb 30. 4 pills, twice a day. For 3 days. Can revert back after that.